When you’re looking for ways to cut down on your utility payments and add to your savings, consider controlling your thermostat settings. 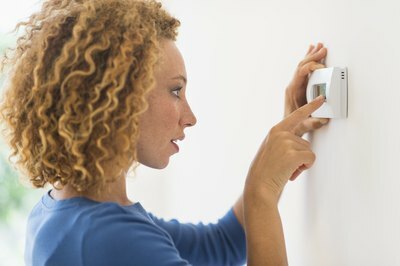 According to Energy Star, you’ll save 1 percent on your utility bill by lowering the temperature by 1 degree for eight hours when heating your house. You can cut your energy costs even more when cooling. Savings equal about 3 percent for every degree you set the thermostat above 75 degrees Fahrenheit. Programmable thermostats come with four pre-arranged setting options. They allow you to program the temperature for when you wake up, during the day and evening, and while you sleep. The key is to figure out what the optimal settings are for your lifestyle and program those times and temperatures into the device. For example, if you typically get up at 7 a.m., you might set your waking temperature for 6:30 a.m. so that the house will be warmed or cooled appropriately by the time you’re up. Then you can have the heat reduced during the day when you’re either not at home or moving around. In the summer, you can set the thermostat a little higher for when you’re not going to be home. Some programmable thermostats allow you to set up the program for seven days or to accommodate weekends with five-plus-two setting arrangements. There are a host of other steps you can take to reduce your energy costs once you’ve got your thermostat programmed. Keep your doors closed as much as possible to reduce the loss of heat or cool air. Weatherproof windows so precious air doesn’t escape when you’re running your heating and air-conditioning. Replace the air filters in your heating and cooling units at least twice a year for maximum efficiency, and if you’ve got an attic, make sure it’s insulated properly. That alone can save you another 30 percent on your heating and cooling costs.